Harrison was inaugurated in a relentless rainstorm, with Grover Cleveland holding an umbrella over his successor's head. His address, after crediting the nation's growth to the benign influences of education and religion, urged that the cotton states and mining territories attain the thriving industrial levels of the states of the Atlantic seaboard, and toward that end, he reaffirmed his promise of a protective tariff. Stressing that "laws are general, and their administration should be uniform and equal," without special regard for sections, Harrison in effect foreclosed special treatment for the South. He urged that blacks be granted the right to vote in both North and South. He lamented the proliferating monopolies and trusts, and he committed his administration to the advancement of social justice. Harrison also urged early statehood for the territories and in general terms advocated pensions for veterans, a statement that evoked the most enthusiastic applause. He declared that the civil service law would be applied fully and that party service would not become "a shield for official negligence, incompetence or delinquency." 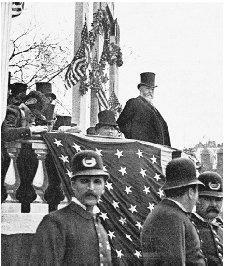 Benjamin Harrison speaks to a crowd. Harrison was a noted orator and relied on his well-crafted skills during his legal and political career. Harrison clearly accorded the development of national strength the foremost priority.